Our Pueraria Mirifica Breast Enhancement Capsules contain 100% pure Pueraria Mirifica extract which when digested as a herbal remedy increases blood stimulation throughout the body and has been proven in studies to enlarge & enhance the breasts and surrounding tissues, creating smoother & firmer breasts. Product Features Directions & Uses: Our Pueraria Mirifica Breast Enhancement & Enlargement Capsules will add between 1 to 3 cup sizes to your breasts. They increase blood flow and circulation throughout the body and target specific areas of the anatomy stimulating the development of the mammary and glandular tissues. This in result will give you more fuller, firmer and more defined breasts. The key element within the Pueraria Mirifica extract is its richness and high levels of Phytoestrogens. These Phytoestrogens interact with the bodies natural tissues as it is 100% herbal and give the user many health & beauty benefits such as: • Firmer & larger breasts • Softer & smoother looking skin • Rejuvenation of the skin with its anti-aging effects • Increased energy and mental well-being • Increased blood circulation throughout body • Stronger, healthier looking hair • Reduces graying hair The Phytoestrogens that acts within the Pueraria Mirifica capsules have an organic way to harmonize with the body’s endocrine system, acting similarly to the oestrogen hormone naturally produced within the body during growth and development stages in your body’s clockwork which is why these capsules have such amazing results allowing you to see visible changes within just weeks. Phytoestrogens Dioxymiroestrol and Miroestrol are the two main components that form the Phytoestrogen elements found within the Pueraria Mirifica plant. These Phytoestorgen molecules are ‘bio-identical’ to many naturally occurring oestrogen molecules throughout our bodies, which is what makes these capsules so useful as a rejuvenating health product. Oestrogen levels vary from person to person, some people may have lower levels than most, which can result in lower self-esteem and confidence. Low oestrogen levels can have an effect on the body such as premature wrinkling of the skin, graying hair and sagging breasts. Pueraria Mirifica contains many wonderful healing and rejuvenation properties to help counteract the effects of premature aging, sagging of the breasts and graying of hair and can actually have a reversing effect on them. 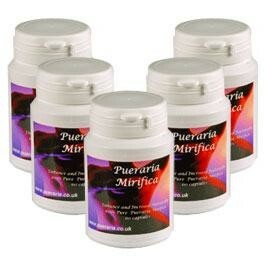 It is this that makes Pueraria Mirifica a unique and entirely natural remedy for maintaining body & health. Our Capsules are 100% Pure Pueraria Mirifica. Dosage: Take 1 capsule after breakfast and 1 capsule before bedtime, take for at least 4 months Take for at least 3 months to achieve maximum results. We highly recommend you use these capsules in conjunction with our breast enhancing spray WARNING: If you are under the age of 18, pregnant, a nursing mother, or if you have been diagnosed with a tumour in an ‘oestrogen organ’ such as the ovaries, uterus, and/or breasts – you should refrain from taking our capsules.